If you’re anything like us, when you were a kid you were probably fascinated with trains. They seemed like giant, metal monsters rolling down the track, propelled by fire (or much more likely some other mode of locomotion, like electricity). They delighted and amazed us. As we grew older, our love of trains diminished and we became engrossed in more grown-up pursuits like dating, social media, and (once we hit the ripe old age of 21) booze. And by booze, we mean beer. Even though we had other interests, there was always a little voice that never let us forget about the freedom and excitement of traveling on a train. Luckily, now we can finally enjoy trains and beer together. That’s because the Durango Brew Train combines the scenery of the Colorado Mountains and whole lot of craft beer. What could be better than that? Nothing, that’s what. Along the way, you’ll sample brews from Steamworks, Ska, Animas Brewing, Carvers, Four Peaks, and Left Hand Brewing. You’ll also get a chance to talk about the brewing process and learn a little bit each brewery along the way. 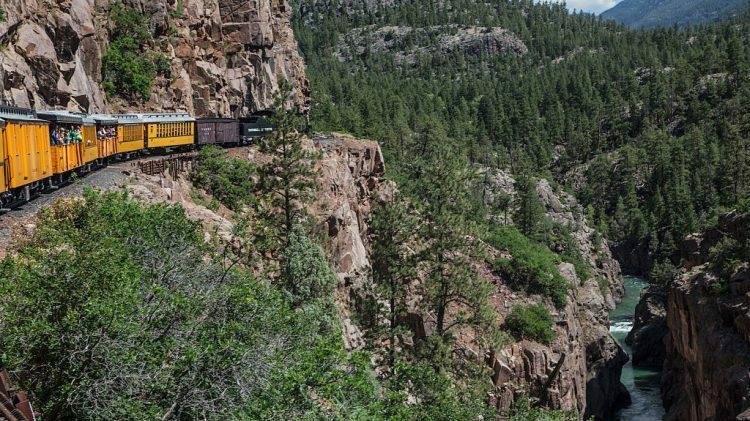 Sadly, the train only runs a few times per year (and only once this year), but, if you’re lucky enough to get a ticket, you’ll enjoy breathtaking views between Durango, Colorado and Cascade Canyon in the San Juan National Forest. Once there, you’ll be treated to a catered meal, more beer, and live music. The Durango Brew Train will depart the Durango Depot at 10 a.m. on Sept. 29 for its only run this year. After a little over two hours of beers and scenic views, the train arrives in Cascade Canyon. Following a tasty meal, more beer, local tunes, and a walk to take some ridiculous photos, the train will depart. You’ll return to Durango full of both beer and food just after 4 p.m. The whole trip will only set you back $169 for a premium seat and $109 for a standard seat. That seems like a pretty good deal to us.